Situational awareness: VP Mike Pence directed NASA to return astronauts to the surface of the moon within the next five years, using either the troubled Space Launch System (SLS) rocket or a rocket from a private space company. And just like that, the Jussie Smollett legal saga is over, with Chicago officials fuming over what Mayor Rahm Emanuel called a "whitewash of justice." 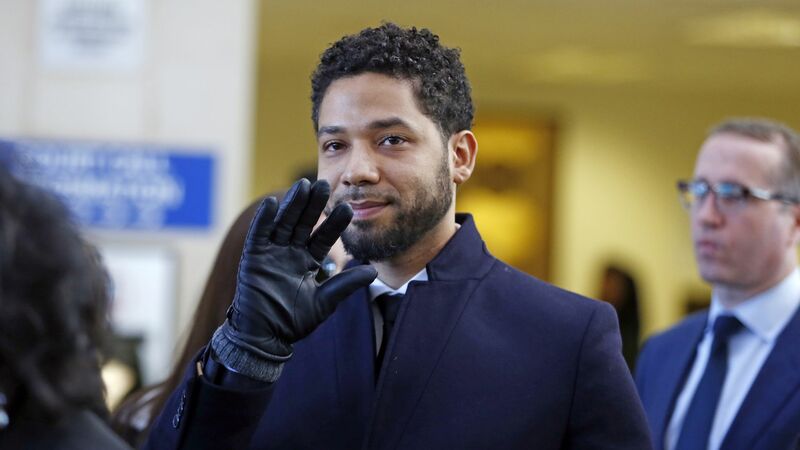 Why it matters: This has been one of the biggest non-Trump stories of 2019, with Smollett's status shifting from apparent hate crime victim to apparent hoaxer facing felony charges. Now his 16 counts for disorderly conduct have been dropped in exchange for community service and forfeiting his bail bond, the Chicago Tribune reports. In another surprise, the judge overseeing Smollett's case sealed the public court file, the Tribune notes. Cook County State’s Attorney’s Office: “After reviewing all of the facts and circumstances of the case, including Mr. Smollett’s volunteer service in the community and agreement to forfeit his bond to the city of Chicago, we believe this outcome is a just disposition and appropriate resolution to this case." Prosecutor Joseph Magats: “The fact that [Smollett] feels that we have exonerated him, we have not. I can’t make it any clearer than that." Smollett after the hearing: “I want you to know that not for a moment was it in vain. I have been truthful and consistent from day one." Fox Entertainment, the home of "Empire," his TV show: “Jussie Smollett has always maintained his innocence and we are gratified that all charges against him have been dismissed." 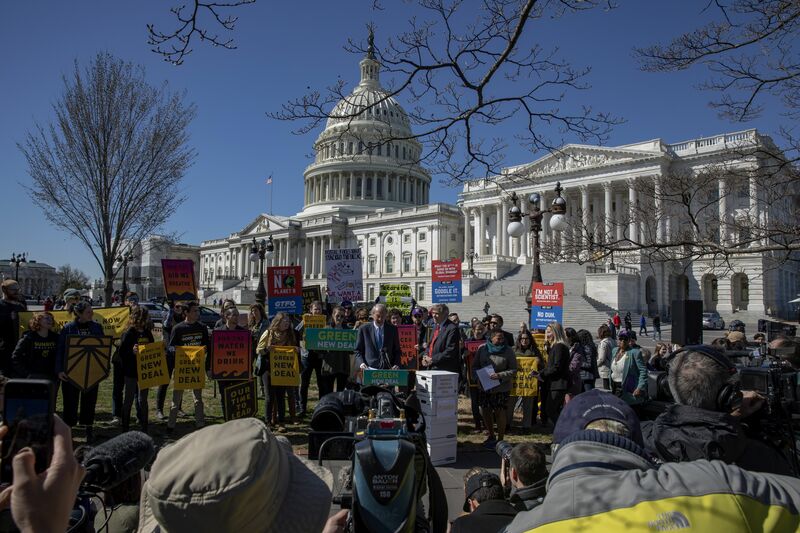 Senator Edward Markey (D-MA) speaks on Capitol Hill today as protesters called for climate action in Congress. The fastest-flowing and thinning glacier on Greenland over the past 20 years has temporarily slowed its retreat and thickened in the past few years, scientists say. Go deeper. Purdue Pharma, the producer of OxyContin, settled a lawsuit alleging the company made billions while fueling the country's opioid crisis, reports Bloomberg. The House failed to override Trump's first veto, which he used against a resolution that targeted his border security national emergency. Michelle Obama's memoir "Becoming" is on track to become the best-selling memoir of all time, with nearly 10 million copies sold since its November release, the Wall Street Journal reports. 1 🎧thing: Axios' Dan Primack and Kendall Baker dig into the extortion charges against Michael Avenatti, and what it means for both Nike and the NCAA, in less than 10 minutes. Give it a listen. At least a million personal wells used for drinking water could be contaminated following major flooding in the Midwest, reports AP. "The first time I came across a man’s dating app profile that showed him with Joe Biden, I laughed. The sixth time I found it mind-boggling, and by the 11th time, I had to find out what was going on," Leigh Giangreco writes for the Washington Post. "I have seen innumerable photos of men hoisting large fish by the mouth to show their grit, outdoorsiness and willingness to be a provider." "Joe Biden’s omnipresence anoints him the hoisted fish of celebrity selfies." "One woman sent me a zip file filled with 23 men’s profiles she’d gathered from Tinder, Bumble and the League featuring Biden in all his various incarnations: the cozy selfie; the photo bomb; the official grip-and-grin set against a navy backdrop, flanked by American flags."